The month of March is such a great time of year for college basketball fans with terms such as, “brackets”, “seeds”, “Cinderella’s” and “Gonzaga” being talked about in offices and at dinner tables across the country. March is truly the most wonderful time of year for college basketball players, coaches and fans. The aspect of a “win or go home” scenario gets people excited. And let’s be honest, nothing is more American than a big underdog with one shot to slay a heavy favorite…we love those opportunities! But, you should know that March is also a cruel month for those involved in college basketball as well. Because in reality, every team, except for a lucky few, ends their season with a loss, and when the season ends, the careers of the seniors on their team ends as well. That is why March can be very cruel too. This year when we lost our East Coast Conference Tournament game to a very good St. Thomas Aquinas team, I was upset…upset that we lost, upset that we could not advance to the NCAA Tournament, but most upset that I would never have a chance to coach our seniors, Alex Borges, Supreme Hannah, Jesse Lalka, Arif Mehmetaj and JJ Wilkes again. These 5 young men who have represented Daemen College so well on and off of the court for the past 2, 3 4 and in some cases 5 years, would never get to wear a Daemen jersey again-and that made me sad (honestly I get a lump in my throat just writing about it right now). See, you have to understand that a basketball season starts in September with preseason conditioning, when our team is up at 6 AM three days a week and running on a cold, dark track to get in shape for practice to begin. That’s in addition to on-court skill workouts and weight lifting sessions with our strength coach. Once official practice starts on October 15th, we practice 6 days a week for 3 hours per day to get ready for the regular season to start in mid-November. As games get going we continue the 6 day per week schedule, but then you mix in bus trips, hotel stays and team meals which help bring your team even closer. This is on top of study tables and academic meetings to make sure our team is taking care of business in the classroom –which of course is the most important part of their college careers. So when March rolls around, your team has typically spent more time with each other than they have with their own family…and the good teams are really close, like a family. That’s what makes the sudden death ending we face in March so gut-wrenching. After spending so much time together, you have to put the uniforms away and you will never have that team, with those people, together again. You may ask, “Why do you coach if it ends in a gut-wrenching manner?” Well, actually, it’s not about the games in March; it’s about the journey to get to March. I know it sounds like a cliché, but in reality it’s the journey that matters. When you get to watch a bunch of guys come together for the greater good of a team; when you watch individuals sacrifice for each other; when you see 18-21 year old young men care about the group more than they care about themselves…that to me is awesome! And that is why you coach. You see we all start our season with a loss…we just don’t know when that loss will be. But it’s not that loss that matters. What matters is the 6 months leading up to that loss. Because in those 6 months, you are hoping that your student-athletes are becoming better students, better athletes and most importantly better people! So whenever I watch an NCAA Tournament game, and the TV cameras show a student-athlete crying on the bench at the end of the game, I feel sad. I will think about the seniors like Alex and Jesse and Supreme and Arif and JJ and all they have meant to our team and to my family in their time at Daemen. But then I will smile, and I will be very thankful for the opportunity that I had to be a small part of their lives, and I will realize how lucky I am because I had the chance to coach them. Then the TV cameras will show the winning team celebrating and cutting down the nets. And I will think of the guys we have coming back and the opportunity we will have next year. I will become excited because I have had the chance to coach in the Division I NCAA Tournament and the Division III NCAA Tournament, and I want nothing more than to coach Daemen in the Division II NCAA Tournament. And the whole process of getting our team ready to reach that goal will start all over again. Let the journey begin! 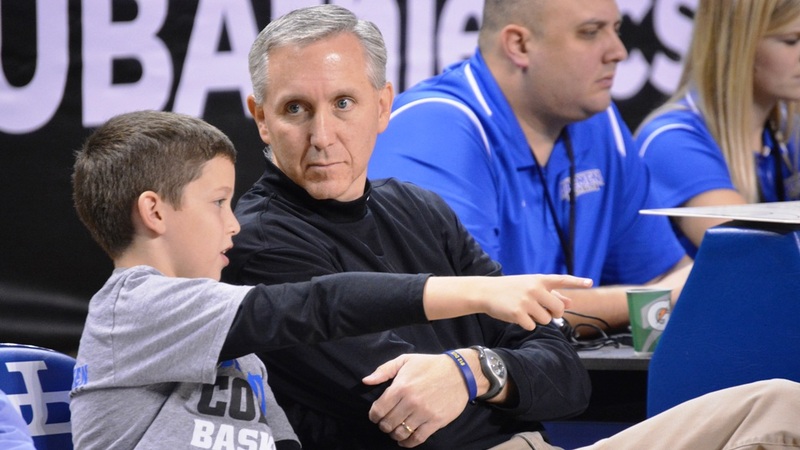 Mike MacDonald is currently the Head Men’s Basketball Coach at Daemen College in Buffalo, NY and a respected veteran of the profession with the rare experience of having been a Head Coach at the NCAA Division 1, 2 and 3 levels. A graduate of St Bonaventure University, Mike spent 9 seasons as the head coach at Canisius where he compiled the 3rd most wins in school history. He then spent 8 seasons at Division 3 Medaille College where he became the all-time winningest coach and was named the Conference Coach of the Year on four occasions. Mike will be entering his 4th season at Division 2 Deamen College where he has established yet another winning culture leading Daemen to a 59-29 record over his first 3 seasons. Absolutely as well said (writtten) as it gets! Very well said Coach. You continue to do things the right way and your players reflect that. Best wishes for continued success! !